The bathroom is your home’s most sacred and transformative space where you retreat after an exhausting day to rejuvenate your mind, body and soul. It is the most private of spaces and calls for a design that celebrates the sublime and the sensual. When planning a bathroom remodel we embrace the use of space, light, texture and color with the specific intent to inspire tranquility. What is your dream element in a bathroom? How many people will be using the bathroom at any given time? What elements will be incorporated (i.e., tub, shower, toilet, bidet, sinks)? What devices are used (i.e., blow dryer, curling iron, shaving gear)? This is important for decisions regarding space organization and circulation. How important is easy cleanup? This helps us to define the appropriate surface materials. Lastly, we ask that you run your daily bathroom routine through your mind and even physically act out your routine as you get ready each day. This helps us to identify placement of key spaces and hone in on the specifics that will make your daily routine quicker, easier and more enjoyable. The need to replace an outdated and leaking shower is often behind the decision to remodel a bathroom. The shower is a space that allows for creative tile and patterns only limited by your imagination. We create custom niches specifically designed for your shower items, and we even incorporated a seat warmer for a recent client. 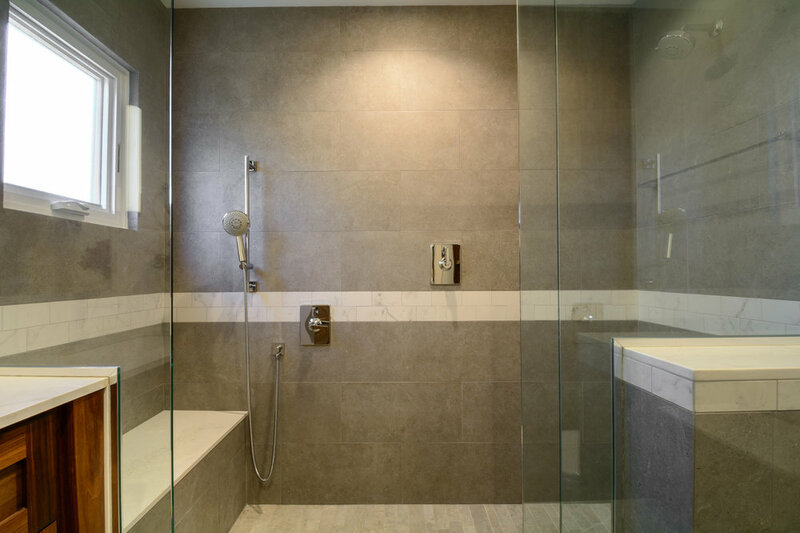 We have installed several curb-less showers for clients who desire a sleek transition and ease of accessibility. Whatever your desire in a shower, the options are endless. Whether you’re looking for a soaking tub for tranquility or a kid-friendly design, our unique Design-Build process will ensure that the tub installed by our team is perfect for your lifestyle. We work closely with trusted suppliers to explore every option available. The right sink for the right counter-top can add unique personality to your bathroom. We take the guess-work out of this important decision by helping you weigh the pros and cons of sink styles such as under-mounted, drop-in and vessel, to name a few. 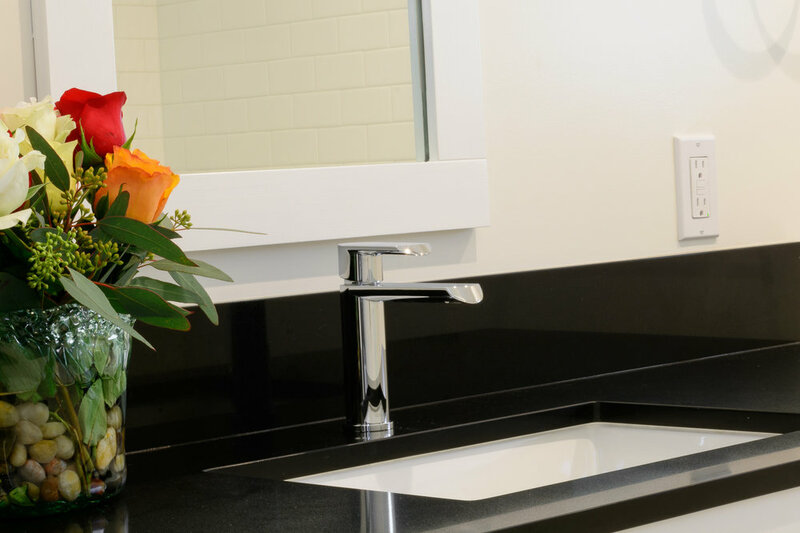 From natural to man-made, counter-tops add lasting beauty to any bathroom remodel. When making the decision and picking the material and fabrication style, Lotus is there every step of the way to ensure durability and finish. Toilets and bidets vary in color, style and even height, and we consider all aspects when helping you make the right choice. Bathrooms usually have two forms of lighting - general and task. General lighting is the natural light and recessed lighting that give the space its’ overall glow. Task lighting is used for shaving, applying makeup, and other specific tasks, and can illuminate from the top or the sides of the mirror. We consider your daily routine and specific needs when choosing lighting. Like kitchen cabinetry, bathroom cabinetry is most functional when tailor-made to your specific day-to-day needs. Good cabinetry design should incorporate the necessary space for storage of toiletries, towels and other items, and should be designed with durability and function in mind. Small bathrooms require even more imaginative and cleverly-placed storage abilities. Our designs convey your particular style by using materials such as natural wood, which adds a layer of naturalism, or in-depth painted cabinetry which can incorporate bold colors or muted undertones to the room. 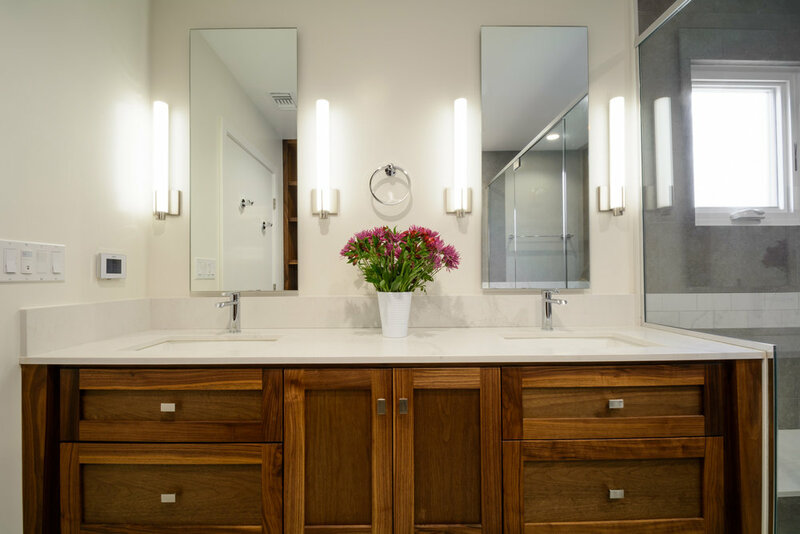 Two main things to consider when choosing your fixtures are beauty and function. Aesthetics of your new fixtures will support the overall design of the bathroom. The quality of the fixture and its’ plumbing accessories not only enhances the visual and tactile appeal, but ensures durability over time. Our extensive experience helps us to eliminate products that may not perform well over time. 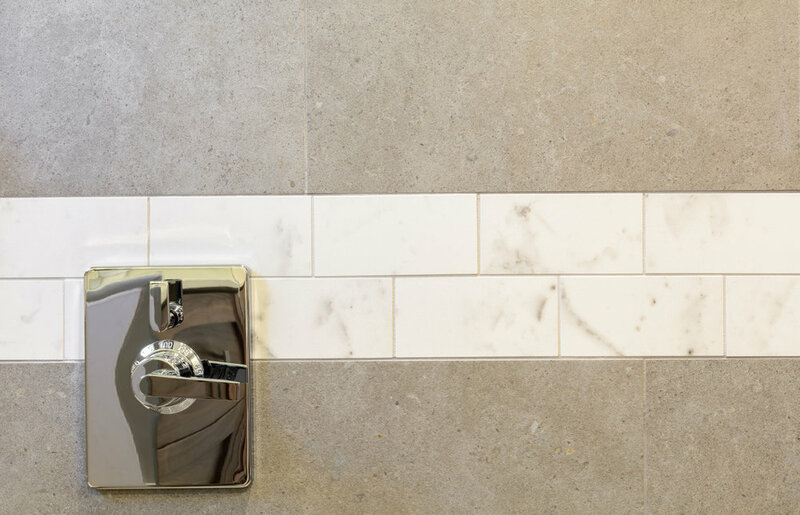 There are two key elements to bathroom flooring – performance and style. 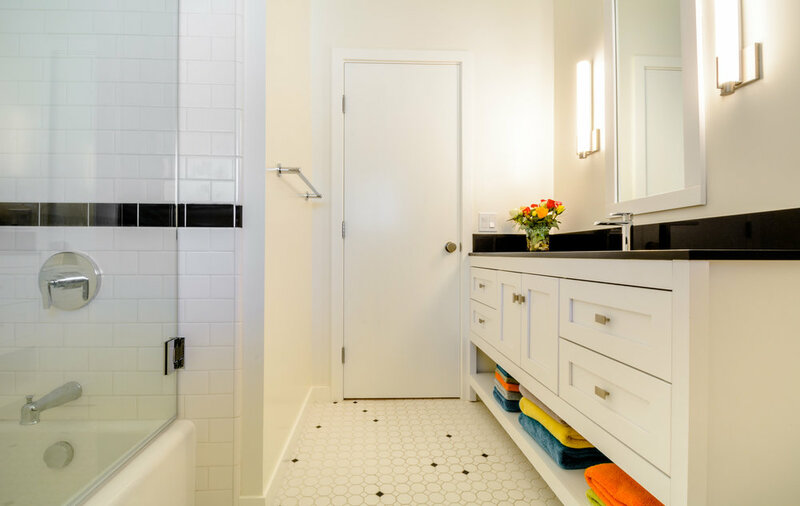 Bathroom floors are the most used floor in our homes aside from the kitchen, and they need to be durable, water proof and easy to clean. It’s also important to consider the tactile element to ensure that your bare feet are happy. Whether you want flooring with an imaginative pattern or smooth color for simplicity, we create stunning long-lasting floors that make your feet smile. 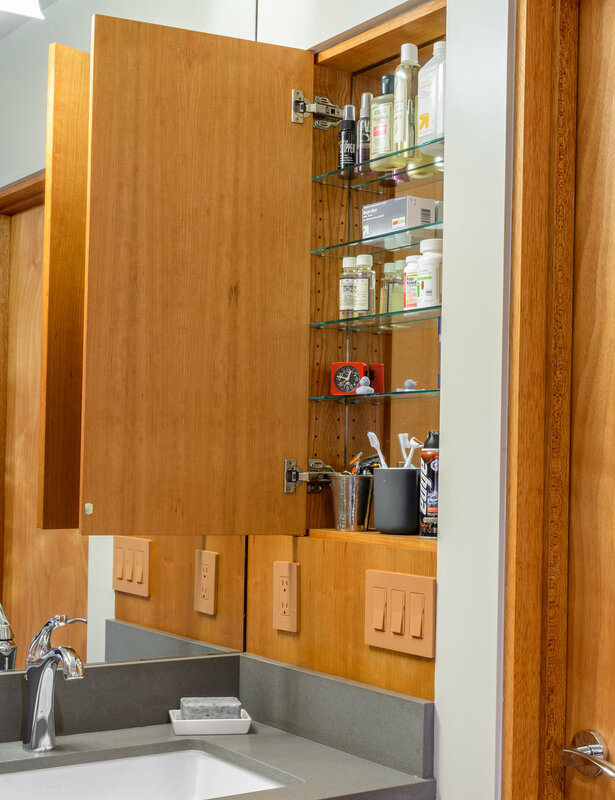 When you remodel your bathroom you have an opportunity to integrate medicine cabinetry in a unique way. Gone are the days when we were forced to settle for the plain metal and mirror medicine cabinet. We love to custom design cabinets into wood work to create a hidden storage gems. Or, you may prefer one of the many high-tech cabinets on the market that include built-in lighting, power, and televisions. The idiom “God is in the detail” has been attributed to a number of different individuals, most notably to German-born architect Ludwig Mies van der Rohe. We at Lotus strongly believe that details are of utmost importance, and we are dedicated to making sure they have the attention they deserve, from the seamless fit in our baseboards to the distance between the cabinet doors and drawers.